or keep out of trouble by spending more than you earn. 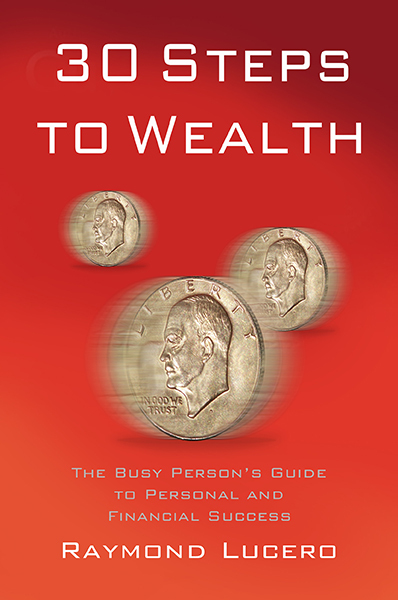 By wasting money on entertainment and unnecessary wants, you’d have nothing left for building wealth or security. This is even worse if you used bad debt to pay for it all. Like what the bible said, “the borrower is the slave to the lender (Proverbs 22:7).” If and when you have an emergency (car accident, hospitalization, etc.) and in need of a lot of money, never forget: You still need to pay for that new cellphone or entertainment system you bought using your credit card or payday loan. and you cannot help little men by tearing down big men. One person became an athlete by training four hours a day after work and another learned business, investing, and leadership skills by reading good nonfiction books every day while you wasted hours watching TV and funny internet videos. If you get rid of both of those people, will you become a stronger athlete or learn business, investing, and leadership? No. You just lost people who could have helped train or educate you so you can become a better person. You cannot solve ignorance, poverty, disease, illiteracy, pollution, world hunger, and any other problem in the world when you’re too busy hating other people for their beliefs and worldviews. You also should not hate people for the blessings they’ve been born with and the achievements they’ve earned. It’s best for us to concentrate on the blessings and talents that we have and on using them to achieve our own success instead of belittling or criticizing others. We all have to do our part in the best ways we know how. Some people don’t get to succeed in life because they spend most of their energy and time being envious of those who have succeeded, instead of learning from them. 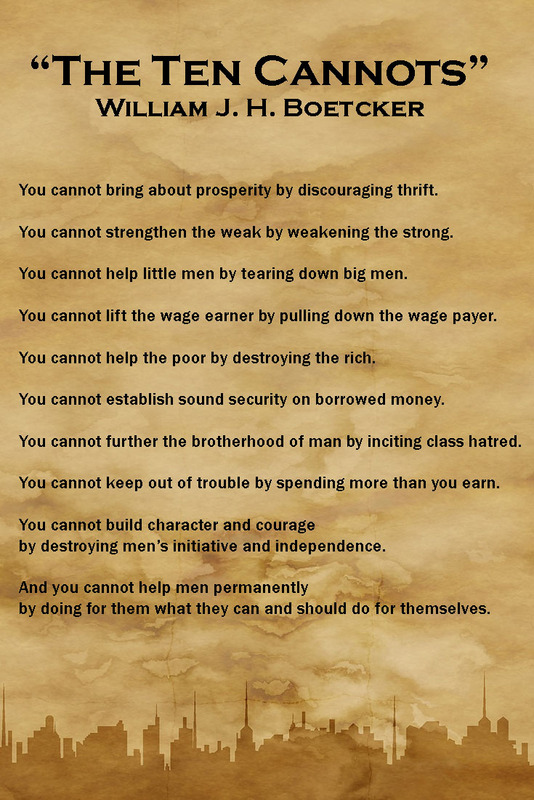 and you cannot lift the wage earner by pulling down the wage payer. Indeed, there are criminals who get rich through evil means and they should rightfully be punished. Be warned, however, that it is a HUGE mistake to think that ALL wealthy people are evil. The VAST majority of them earned it by creating value and doing good. If we want to help people, we have to remember that the “Robin Hood” style of stealing from the rich and giving to the poor will not work. Think about it. To a homeless beggar, YOU are rich. If I steal all that you have right now (your home and everything your family owns) to give to the poor, will you be happy? Will the beggars suddenly have careers and businesses and become self-sufficient after they get a few hundred dollars? No. They’ll likely spend that money on food and go begging for alms again when the cash runs out. Think about this too. A doctor has set up his clinic nearby and is earning a lot of money. Is it right to destroy that clinic which heals hundreds of sick people a week because the doctor is earning a lot more money than everyone else? Will more patients get healed if you do that? No. Imagine somebody starts a construction company. Is it right to destroy that business, make hundreds of construction workers unemployed, and have less projects built because that business owner grew rich (or to put it in another way… “grew richer than you”)? Will people have more homes and buildings to use if you do that? No. Think about this: Who created and sold you your computer? Your phone? The building materials for your home? Your food? Your drinking water? Your internet? Electricity? Your car? Your clothes? Everything you have and use? Aren’t you better off because of all of those things, and didn’t those people get rich by selling things people use to make life easier? Don’t YOU earn money and wealth by creating products or providing services that other people want and need? Is it right for somebody to destroy your business or get you fired from your job because you’re “richer” than them? You cannot become successful by making others fail. All that does is keep EVERYONE in a state of failure and suffering. That time and effort you spent ruining others? You could have used it to earn your OWN success. Will people risk starting businesses or getting jobs if you simply give them free food and money? No. They’d just waste the money you give on entertainment. Why should they get a job when they can get free money from you anyway? That’s one major way to make sure somebody becomes a failure – do all their work for them. When you disappear (you die or get sick), they’ll be powerless as they’ve been dependent on you for so long. You didn’t help them by solving all their problems – you just made them helpless. 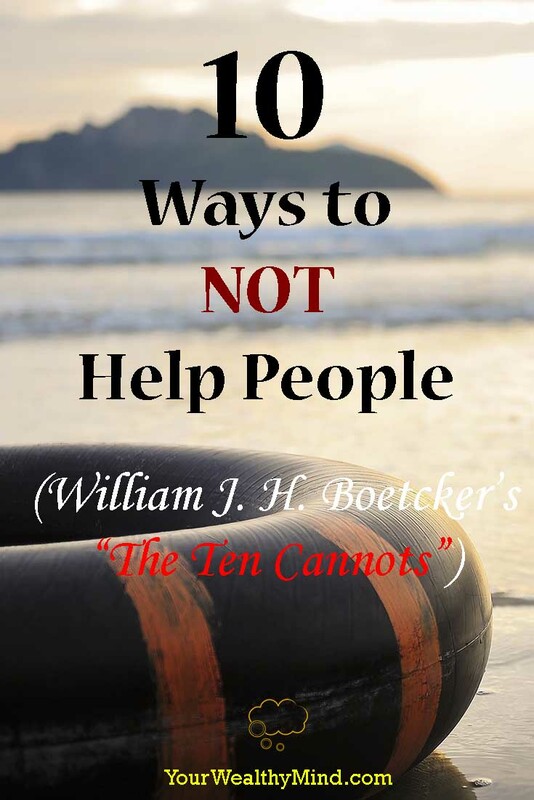 So what’s the best way to help others? The secret is in the old proverb: “Give a man a fish, and you’ll feel him for a day. TEACH a man HOW to fish and they’ll eat for a lifetime.” Educate people and show them how they succeed by themselves. Love it! I am big on managing your energy to create an inspired life. I often say No to folks because doing so empowers them. Like some of my readers make the excuse that they can’t buy my eBooks because they are too young to have credit cards. So since I see them as empowered I give them 10 ways to get the money to buy the eBooks. I don’t appease them. I say No to their excuses. Give people their power back! Thanks for sharing Ray! Glad you like it! Nice blog by the way, and awesome eBooks! I’ll keep them in mind as they seem to be useful for bloggers/writers like me.